An imposing 19th Century city centre pub has re-opened following an extensive refit by a joint partnership of three breweries including Oxford’s own White Horse Brewery. The Royal Blenheim, St Ebbes Street, Oxford, popular with real and craft ale drinkers, had been closed for just under a month to allow refurbishment work to go ahead. The refurbishment has been completed in a unique partnership between three breweries, White Horse, of Stanford in the Vale, Oxfordshire, Titanic Brewery, Stoke-on-Trent, and Everards, of Leicester. 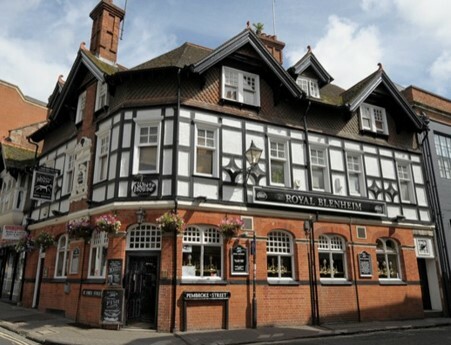 The trio combined to re-open the Royal Blenheim in an agreement which allows a great range of beers in a wonderful central location within Oxford. The partnership is a new version of Project William, an initiative which began in the late 1990s as Everards and Titanic worked together to reopen pubs and grow the Titanic brand in its north and mid Staffordshire heartland. At the Royal Blenheim, Everards are the main funders, Titanic manage the pub as part of its growing portfolio, and the White Horse Brewery benefits from a locally branded pub selling its produce. Titanic Brewery’s owners, brothers David and Keith Bott, are also shareholders in the White Horse Brewery. David Bott said: “Buying pubs in this way makes perfect sense for smaller breweries. As a larger brewery, Everards have the buying-power and, at Titanic, we have the knowledge of opening and running successful community pubs. White Horse has a reputation locally for good beer and they now have a strong presence in Oxford city centre through the Royal Blenheim, while Titanic and Everards gain a presence for beers such as Iceberg, Plum Porter, Tiger and Sunchaser. Named in honour of historic local landmark, the Uffington White Horse, White Horse Brewery was established in 2004 and has grown a reputation for fine ales including Black Beauty, Village Idiot and Wayland Smithy. Its beer can be found, on a regular basis, in many pubs across Oxfordshire. In contrast, Everards has been trading since the 19th Century and owns scores of pubs in its East Midlands catchment area and beyond. Titanic Brewery was founded in 1985 and is owned by brothers David & Keith Bott. It started life as a micro-brewery but has grown to produce over three million pints of beer a year and employs around 150 people.